What makes Bass Headphones Different from other Types of Headphones? If you are into bass-heavy music, you will get nowhere with a regular pair of headphones or earbuds. You need something with excellent bass response or even boosted bass and this is the best place to start your search. Our article on 15 best bass headphones is designed to help you find the best pair of bass headphones for your budget and your needs. Before we present our selection of 15 best bass headphones to you, we will make a short introduction where you can find all the important info about bass tones and bassline in music. You can also read about differences between bass headphones and ‘’regular’’ headphones and find out what are the most important characteristics of bass headphones. After this short introduction, you can find our list of 15 best bass headphones. We’ve tested a bunch of headphones and selected those that will make your head spin. If you don’t want to spend too much, you will find some nice and affordable choices here and if you want to really redefine your listening experience, there are some high-end models that will blow your mind. In the end, we will try to make a short summary and give you a list of all the things you should pay attention to when buying a pair of bass headphones. Bass tones are all the low-end tones. To be more specific, all the tones ranging from 16 or 20Hz to 250Hz are considered bass tones. All the tones below 20Hz are not audible but they can be felt so it’s not a bad thing if your headphones can go lower than 20Hz. This short range of low-end tones can be divided into 3 smaller ones – sub-bass (20-80Hz), mid-bass (80-150Hz), and upper-bass (150-250Hz). Only a few instruments can produce sub-bass tones – bassoon, bass, harp, piano, and organ. Mid and upper-bass can be produced by many instruments and some male voices. In every song and musical piece, you can make a difference between two parts – melody and bassline. We can all recognize the melody intuitively – that’s the main theme and the one that you would sing or whistle. The bassline is not so distinctive but it’s equally important. This part is supposed to give the rhythm and harmony to a song and to put an emphasis on every root note and on the first beat. The bassline is the bass part of the song, the one that consists of low-end tones. It’s not always melodic but it’s still really important. Some songs became famous and recognizable because of their bassline parts. Many contemporary music genres, especially in the field of electronic music, put a huge emphasis on the bass but you can find strong and famous bass parts in pop music, rap, R&B, heavy metal, etc. The bass plays such an important role in today’s music and it has become even more melodic. In general, every song and every musical piece is driven by the bass but since it’s more emphasized in those contemporary genres, we use terms bass-driven or bass-heavy music to describe those genres. Bass-heavy music is more popular today than it was ever before and there’s even a scientific explanation for that. There’s a paper called ‘’ Superior time perception for lower musical pitch explains why bass-ranged instruments lay down musical rhythms’’ published by McMaster Institute for Music and the Mind – the researchers from this institute proved that human brain follows the low-end tones with more ease than high-end tones (treble). So, it’s really simple – it’s in our nature to follow the bass and to love it. In order to really enjoy the bass-heavy music, you need a pair of headphones with a nice low-end reproduction. In short, you need a nice pair of bass headphones. But how to differentiate bass headphones from other types of headphones? They are not different from others when it comes exterior design but there are some subtle differences that you can read about in the next section. The quality of noise isolation (or cancellation) can make a great difference. Noise isolation and noise canceling are not the same things. Noise isolation is a passive way of isolation and it depends on the shape and size of the earcups and earpads (or on the size and shape of earbuds) as well as on the clamping force of the headphones. Every pair of headphones (in-ear, on-ear, over-ear) offer some kind of noise isolation but they are not all equally good. On-ear headphones are probably the worst when it comes to (passive) noise isolation. Noise canceling is a similar but still different type of noise isolation and you will find this feature (it’s called ANC or Active Noise Canceling) on more expensive headphone models. ANC is actually a piece of software in charge of producing the signal (sound wave) that’s opposite to the sum of audio signals (waves) coming from your surroundings. That way, ANC manages to completely cancel out all the environmental noises. Both noise isolation and noise canceling are important if you want a cleaner sound. They don’t affect the quality of the bass (or the overall quality of the sound) but they can make your listening experience much better. Now that you know the most important things about bass headphones, we will present our selection of 15 best bass headphones to you. These are our favorites. V-MODA is a relatively new player (founded in 2004) on the market but they made a big entrance and their headphones are already very popular but also very expensive. The price varies depending on the color but you can get this specific model for $200-$250. Crossfade M-100 is their bestseller. It’s popular among DJs but it’s also highly prized by the regular people. It’s one of the best choices when it comes to bass. These headphones really deliver earth-shaking bass. Crossfade M-100 headphones come in a premium packaging which is pretty much expected considering the price. V-MODA really paid attention to every little detail. All the important technical specs and features are written on the box. Inside the packaging, you will find your Crossfade M-100 headphones, one sturdy carrying case with a metal carabiner, 1-button microphone cable, one regular audio cable (without mic), one ¼ inch adapter, 2 V-Corks, V-MODA sticker, user manual, and 2-year warranty card. There are also some accessories that you can buy separately like replaceable metal shields (the ones that go on the outer side of the earcups), detachable audio cables, and 3-button mic cables in different colors, coiled audio cable for DJs (CoilPro), XL and regular memory cushions (earpads), BoomPro mic for gaming, etc. Crossfade M-100 are over-ear headphones and they are quite large. They weigh 280g (9.9 ounces), their frequency response spans from 5Hz to 30kHz, sensitivity is 103dB (measured at 1kHz frequency and 1mW input power), and impedance is 32Ω (they can be connected to your phone and they will work just fine, you don’t need a headphone amp). Inside each earcup, there is one 50mm dual diaphragm driver. Usually, we don’t like to talk much about the design since we all have different criteria but these are simply beautiful. The moment you look at these, you know that the manufacturer paid attention to every detail. Everything on Crossfade M-100 is stylish. They are so fashionable and probably one of the most beautiful on the market. When it comes to construction quality, V-MODA tried to make a durable product. Many parts are reinforced and there’s a lot of metal. You can tell that just by lifting the package, you don’t even have to open it (it’s pretty heavy). Earcups are reinforced with metal shields, the headband is made from aluminum and then covered with some kind of cloth (or fake leather, depending on the model). All in all, we are happy with the build quality and durability but there is one important issue we will talk about in the next section. The headphones come with two detachable cables, one with mic and one button that you can use to control the playback and receive/end calls, and the other without a mic and without control buttons (the other is just a regular audio cable). The number of things you can control with the control button is very limited – press once to play/pause, twice to play the next song, three times to play the previous song. The headphones are foldable and they can easily fit a small sturdy case that comes with the headphones. Even though they are over-ear headphones, they are highly portable. Crossfade M-100 deliver super-punchy bass that will make your head spinning. They are not quite consistent across the wide range of frequencies and the bass overpowers the mids and highs from time to time. You can make some EQ adjustments if you want flatter frequency response but if you are a bass head, you will be more than happy with this kind of sound. The microphone is not the best feature of these headphones but it’s definitely usable. Your voice will be muffled in a noisy environment but aside from that, it’s a good-quality microphone. The headphones come with 1-button microphone cable and you have to use that one button to control everything. 3-button cable is also available but you have to buy it separately (not included). Considering the price and the number of available accessories, it would be nice to get a 3-button cable or a spare pair of earpads (cushions). One of the biggest issues regarding V-MODA Crossfade M-100 is the comfort. They will become really uncomfortable after a few hours of wearing. The earpads (cushions) are just too small and even if you buy XL pads, you won’t be happy with their size. The clamping force is also too strong. They put some serious pressure on your ears and on your head. Also, changing the cushions can be quite frustrating. There is no easy way to do that. The headphones are foldable but the earcups don’t swivel which can be a deal breaker if you want to use them for DJing. We have already mentioned that there’s an issue regarding durability. 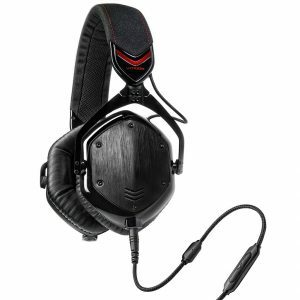 V-MODA made the same mistake many manufacturers made in the past. There are plastic parts on hinges connecting the earcups to the headband and they look quite fragile. In fact, some customers complained about this issue in the past. We were surprised to see these weak joints on such a nice pair of headphones. 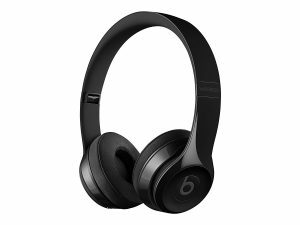 We are not really crazy about Beats products but we can’t deny that Beats Solo 3 wireless headphones have strong bass and that they can get really loud. On top of that, they have a sleek design, many available colors, and they are wireless. We have included only a few wireless headphone models on this list of 15 best bass headphones and these Beats headphones deserved their place on the list. In terms of battery durability and connection quality, Beats Solo 3 are one of the best models on the market. One of the things we don’t like about these headphones is the price. They are definitely overpriced but that’s what happens when there’s such a huge hype about some product. The headphones come in a nice premium box but that’s only natural when it comes to Beats. There is no doubt they care about the presentation a lot. Inside the Beats Solo 3 packaging you will find your headphones, hard carrying case, USB to USB Micro-B charging cable, 3.5mm cable with mic and in-line controls (RemoteTalk cable), metal carabiner, and 1-year warranty. When it comes to technical specs, Beats are secretive even more than Bose. We practically don’t know anything about their headphones. They are wireless on-ear headphones and they weigh 7.6 ounces. That’s about it – no info on the driver size and type of drivers, no info on frequency response, sensitivity, impedance, THD, etc. Beats Solo 3 headphones have a sleek and stylish design. They are not very sporty but we have definitely seen people wearing them during workouts (be aware that they are not sweat resistant and they are not supposed to be used for workouts). These headphones come in many colors and color combination. The number of choices is really huge – you can choose between black (matte finish), rich black (glossy finish), blue, gray, green, purple, red, silver, white, violet, black/red, gold, rose gold, etc. The headphones have cushions covered with fake leather and there’s also a thick layer of padding on the headband. They are not the most comfortable headphones on this list. The headband is adjustable, and the headphones are foldable and very portable. Solo 3 wireless headphones look quite sturdy but they are still made from plastic, so we are not optimistic about their durability. Considering the build quality and materials, these headphones should not be that expensive. So, to conclude, they are not the most durable, there are no metal or reinforced parts but they look sturdy enough. The headphones can be used in two modes – wired and wireless. You can control the playback and answer or take calls in both modes. If you are in wireless mode, you can use the controls on the right earcup. There’s the power button right at the bottom, and three touch-sensitive buttons above the power button. You can use the b letter (right in the middle of the earcup) to play/pause the music or answer/end calls. You can use the other two buttons to control the playback and volume. If you are in wired mode, you will have to use the in-line controls and mic on the cable to control the playback, adjust the volume, or answer/end calls (you can’t use the buttons on the right earcup in wired mode). Solo 3 wireless headphones feature super-durable battery and that’s one of the best things about these headphones. You will get up to 40 hours of listening to music at 80% volume. The battery is really amazing, there is no doubt about that. The headphones also feature Apple W1 chip which allows fast charging – you can get 3 hours of music playback if you charge them for 5 minutes. The headphones offer a super-fast connection and great connection quality. These are optimized for Apple devices and if you have an iPhone you will be connected in two seconds – you just have to turn on the Bluetooth on your phone, bring the headphones close to your phone (not further than 2in), and press the power button. They will be paired in a second. There is some kind of near-field connection involved but it’s not standard NFC. If you are an Android user, the pairing procedure is pretty much standard – turn on the Bluetooth, find Beats Solo in the list of available Bluetooth devices, and pair them. The connection is quite stable, the range is standard 33ft, and we haven’t experienced any issues regarding connection quality. Beats Solo 3 deliver strong and impactful bass and they can be really loud. Unfortunately, the rest of the frequencies doesn’t sound that good and they often get overpowered by the bass. If you are a bass head, you will be happy with the sound but if you are an audiophile, these are not for you. We couldn’t achieve the right balance between lows, mids, and highs. Changing the EQ settings on your phone will make a difference but not a significant difference. These headphones are not the most comfortable on the list. The earpads are quite small and they rest on your ears allowing your ears to ‘’breathe’’ but the clamping force is really strong and you will have to take them off after an hour or two. Earpads are not durable enough and if you use them for workouts, they will be ruined (they will either fall off or peel). The same goes for the headband. The fact is that they are not made for workouts (not sweat or water resistant, no IPX or IP rating) but people still use them in the gym and they feel betrayed when the headphones fall apart. To be completely honest, we are definitely not impressed by their durability and build quality but you don’t get to blame Beats if you don’t use the headphones appropriately. The headphones come with a USB to USB Micro-B charging cable and not a regular USB to micro USB cable, so you can’t use just any cable to charge the headphones. Sony has been in the business for decades so we naturally have high expectations when it comes to Sony’s products. Their XB950B1 Extra Bass headphones are definitely one of the best choices if you are a bass head. If you are not a bass fan or if you are an audiophile, you won’t be perfectly happy with these. In fact, you might end up disappointed because mids and highs are not exactly crisp and clear. But, if the bass is your main concern, these will blow your mind. They deliver so much bass even without that extra bass feature. If you turn it on, the bass will become even stronger and maybe just a little bit overwhelming. The best things about XB950B1 headphones are their design, dual-mode capability (wired or wireless), Bluetooth connectivity and aptX low latency support, great battery durability, and earth-shaking bass. Sony XB950B1 headphones come in a premium box. The presentation is simple and clean but really stylish. Along with the headphones, you will get a USB to micro USB charging cable, detachable audio cable with 3.5mm gold-plated jacks, user manual, and 1-year warranty card. The headphones feature 40mm dome drivers and they are designed as over-ear headphones but it all depends on the size of your ears. If you have smaller or regular ears, these headphones will probably cover your ears but if you have large ears, they will sit on your ears. The headphones weigh 280g, so they are not the lightest headphones on the market. The frequency response spans from 3Hz to 28kHz, headphone impedance is rated at 32Ω, and sensitivity is 105dB. The headphones look quite nice and stylish. They are definitely not designed for sports, so if you need something for your workouts, these are not the right choice (not only because of the looks but because of the build quality and insufficient clamping force). They are available in three colors – black, blue, and red. Whichever color you choose, you won’t make a mistake – they all look really attractive. When it comes to build quality, we can’t say we are completely happy about it but it’s satisfying for the price. They are mostly made of plastic. There are some metal parts, too (like aluminum headband extenders) but the hinges between the cups and the headband are the most problematic parts. You can read about this issue in the next section. Controls are quite simple and easy to use. They are located on the rim of the earcup. You will find volume controls and playback/call controls on the right cup. Power button with two LED lights, Extra Bass button, micro USB charging port, and 3.5mm audio port are on the left cup. We’ve had no major issues regarding comfort. The earpads are quite thick and comfortable, the headband is adjustable, and the earcups can swivel. The layer of padding on the headband is kind of thin but it doesn’t make the headphones less comfortable. They are a little bit too heavy and they will cause some fatigue after a few hours of wearing. The clamping force is strong enough for casual listening to music or walking but not enough for sports and they will definitely fall if you move your head too much. You can use these headphones in wired and wireless modes. The headphones feature Bluetooth 4.1 with standard 33ft of range. Pairing is simple and quick and if you have an Android phone you can use NFC for faster pairing (just tap the NFC logo on the right cup with your phone). These headphones also support aptX low latency Bluetooth profile so you can use them to watch movies or videos on YouTube and you won’t notice any delay. The connection is stable and strong – no cutting out or any other connectivity issues. The battery is quite durable. You can listen to music for up to 18 hours (at 60-70% volume) and recharge takes only 4 hours. Even if you run out of battery, you can always use that audio cable that comes with the headphones and switch to wired mode. The bass that these headphones deliver is super-punchy even without the Extra Bass feature. We can’t really say that the sound is balanced. The mids are a little bit muddy and highs are not perfectly crisp, so if you don’t like that much bass, you won’t be happy with these. When you turn the Extra Bass feature on, the bass becomes too strong for most people and it can overpower the mid-tones. If you don’t like the sound, you can download and install Sony Connect App and play with the equalizer or choose one of the EQ presets. You can change the sound signature a lot with this app – you just need to lower the bass and you will get completely different listening experience. The built-in mic is pretty decent. The person on the other side will hear everything loud and clear. The situation is a little bit different if you are in some noisy environment or if there is too much wind but if you are in your house or in your office you won’t experience any issues. The things we don’t like about these headphones are the hinges (joints) between the earcups and the headband. They are made from plastic and they are really fragile. Many users complained about this. One accidental fall from 4 or 5ft of height can be fatal, so handle them with care. Sony should really reinforce the hinges. They should use metal for those parts instead of plastic. The clamping force is really weak and if you move your head too much, the headphones will fall off your head. The headphones are not foldable and they are kind of bulky, so it’s not that easy to transport them. Since the hinges are so fragile, you will need a hard case and you will have to buy it separately (it’s not included in the package). If you need something affordable but decent, COWIN E7 might be the right choice. You won’t get the same listening experience like with Sony’s XB950B1 or V-MODA’s Crossfade M-100 but you will get a good value for your money. COWIN E7 headphones are comfortable, they can be used as wired or wireless, they feature Bluetooth 4.0 and have an incredible battery. They also look very nice and deliver decent sound quality. It’s not the richest sound, the mids are kind of muddy at high volumes, the highs are ok but could be crispier, and the bass is nice and punchy. There are no bass boost features but the bass response is more than decent. The headphones also feature ANC function but, to be honest, we were not completely satisfied. These headphones do a great job at isolating constant low-pitched sounds but you can still hear all the high-pitched sounds. If you like the design of COWIN E7 but you want something slightly better but still affordable, there’s also an upgraded version offering bigger drivers and bigger bass, upgraded ANC feature, and slightly stronger battery. COWIN E7 headphones come in a nice little black box. The packaging is not really premium but it doesn’t look bad at all. In fact, the presentation is great considering the price. Along with the headphones, you will get a detachable audio cable with 3.5mm jacks on both ends, USB to micro USB charging cable, and a user manual. Carrying case is not included and you have to pay some extra money for that. COWIN E7 are over-ear headphones with 40mm neodymium drivers. Their frequency response spans from 20Hz to 20kHz, their impedance is rated at 32Ω (they can be driven by any phone, iPad, mp3 player, etc. ), and sound to noise ratio is 85dB. COWIN E7 headphones look really nice and elegant, especially when you look at them from a distance. There are two colors available – black (with silver details) and purple. The headphones are entirely made from plastic and that ruins the first impression a little bit. There are practically no metal parts. They seem well-built but not too sturdy or rugged. We have seen that much more expensive models are also made from plastic so it’s not a surprise to see a lot of plastic on these affordable headphones. The most problematic parts are the hinges (joints), specifically that swiveling part and we will talk about it in the next section. COWIN E7 headphones offer a decent amount of comfort. The earpads are nicely padded and soft, the whole headband also has a thick layer of padding. The headband is adjustable and the earcups can swivel. The clamping force is just right – it’s not too strong or too weak. There are three control buttons on the front side of the right earcup arranged in a triangle. You can use these buttons to play/pause the song, answer/end calls, play the previous/next song and adjust the volume. Since there are no dedicated buttons for each function, controlling everything can be tricky at first but once you master the controls, it becomes much easier. You can also find the NFC tag for fast pairing on the right earcup. On the left earcup, you will find an auxiliary input (3.5mm audio port), microphone, and a switch with three positions OFF – BT (Bluetooth) – ANC (active noise canceling). You can use COWIN headphones in two modes – wired and wireless. They feature Bluetooth 4.0 with 33ft of range (under ideal conditions and without obstacles) and fast pairing function (NFC) for Android phones. The connection is stable if you stay within 15-20ft range but after that, it starts to cut out and becomes really annoying. Also, if you move too much, you will experience some signal loss even if the distance between you and your phone is less than 5ft. One of the best things about COWIN E7 headphones is the battery. It has the capacity of 750mAh and it can deliver up to 30 hours of playback per one charge. Recharge takes 4 hours. 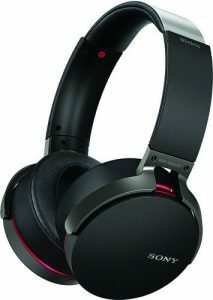 The headphones deliver decent sound quality but they can’t compete with more expensive models we mentioned previously. The bass is deep and aggressive (maybe even too aggressive) and that’s not a problem since these are bass headphones but the mids and highs are muddy especially at high volumes. They simply lack a little bit of clarity. In the end, we can’t really complain that much since they don’t cost much and they offer adequate sound for that kind of money. The microphone is not the best but it’s usable. Your voice will be slightly distorted on the other end but the person you are talking to will understand everything you say. Like many other over-ear headphones, COWIN E7 headphones have fragile hinges (joints) between the earcups and the headband. This is the biggest flaw regarding build quality. Triangular control buttons can be tricky at first and you will need some time to master the controls. You will occasionally change a song while trying to adjust the volume but that’s inevitable with this kind of button arrangement. The headphones are kind of bulky, they are not foldable, and carrying case is not included (you have to pay extra for it). ANC is a nice feature but you can’t really find completely functional and effective ANC on a pair of cheap or affordable headphones. COWIN E7 headphones do a great job when it comes to passive noise isolation thanks to thick protein earpads and that’s a good thing but turning on the ANC function doesn’t make a significant improvement. If anything, it makes things worse because it kills the music and makes the sound a lot flatter. COWIN E7 will isolate most of the low-end noise but it won’t isolate high-pitched noise at all. 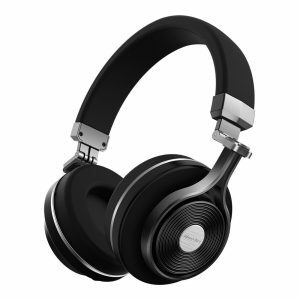 Bluedio T3 is one of the cheapest bass headphones on the market and they are definitely the cheapest Bluetooth bass headphones on our list of 15 best bass headphones (they can be yours for around $50). T3 headphones don’t deliver super-clean sound but they are very heavy on the bass which is the reason why they deserve to be on this list. For the price, they offer more than a satisfying amount of comfort, pretty good connectivity, great battery life, and decent sound quality. Be aware that these aren’t made for everyone. If you are not a fan of bass-heavy music or if you are an audiophile, you won’t be satisfied at all. On top of all this, T3 wireless headphones look really nice and they are made from quality materials. On the negative side, we are not quite happy with their weight (they will become uncomfortable after a few hours of wearing) and we are skeptic about the joints between the earcups and the headband. Bluedio T3 headphones come in a really nice black packaging. The presentation looks almost premium which is surprising considering the price. Along with the headphones, you will get a USB to micro USB charging cable, an AUX cable (3.5mm gold-plated jacks on both ends), black carrying pouch (hard case is not included), user manual, and 1-year warranty card. 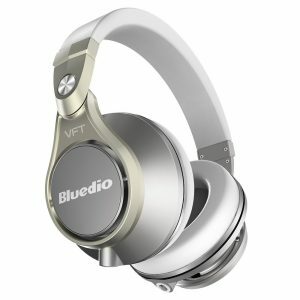 Bluedio T3 are over-ear headphones. They have two 57mm drivers and they weigh 388g (they are really heavy). The frequency response spans from 20Hz to 25kHz, the impedance is rated at 16Ω, their sensitivity is 116dB (they can be really loud), and THD is less than 0.1% (measured at 1kHz). The headphones look quite attractive and elegant. They are available in four colors – black, gold, red, and white. There is also a special version with additional micro-SD card slot. You can really see that Bluedio paid attention to details and tried to make the headphones as beautiful as possible. And we are quite happy with the results. T3 headphones look quite sturdy. There are some plastic parts but there are also many metal reinforcements made from Zinc alloy. In terms of durability and build quality T3 headphones beat even some more expensive models like Sony’s XB950B1. The overall durability is very good but we are still skeptic about the joints even though they are reinforced. We are quite happy with the comfort too. The earpads and headband are nicely padded, the headband is adjustable, the earcups swivel, and the headphones are foldable. We only wish they were lighter. Wearing these headphones for more than two hours will definitely cause some fatigue. Controls are simple but there are no dedicated buttons for each function. There is an AUX port on the left earcup, and all the control buttons, as well as micro USB charging port, are on the right earcup. There are three buttons on the front side of the right earcup. The central button with Bluedio logo is the multifunction button and you can use it to play/pause the song and answer/end calls. You can also use it to turn on/off the headphones and start pairing. When you press this multifunction button and volume down button simultaneously, you can activate/deactivate 3D sound (which is the same thing as bass boost button or Extra Bass button on Sony headphones). There are two more buttons on the left and right side from that multifunction button. You can use them to adjust the volume (long press) or to skip tracks (short press). Just like every wireless headphone model on the list, Bluedio T3 can be used in two modes – wired and wireless. The headphones feature Bluetooth 4.1 with EDR (Enhanced Data Rate). The pairing process is pretty simple and takes just a few seconds. There is no NFC function, so no fast pairing option. The range is standard 33ft under ideal conditions (no obstacles) and approximately 20ft indoors. The connection quality is satisfying – we’ve had no major issues and haven’t experienced any signal loss. The battery is more than satisfying considering the price. You will get up to 20 hours at 60-70% volume and you don’t really have to go louder than that since they can be really loud (but also because the sound gets distorted at high volumes). Recharge takes 2-3 hours. If your battery dies, you can always use the cable that comes with the headphones and use them as any other pair of wired headphones. Sound quality is decent for the price but it’s not for everyone. There’s a huge emphasis on bass frequencies and the mids and highs often get overpowered by the bass. The rest of the audio spectrum is kind of muddy, especially at high volumes. When you turn off the 3D sound feature, you will get more balance, but the bass will still be very strong. The built-in mic is not the best and we are not happy with it but it’s usable. Your voice will be distorted and it will sound kind of distant but the person on the other end will understand you and that’s the most important thing. Bluedio T3 headphones are quite heavy and that kind of weight can cause really awful fatigue after only two hours of use. Also, the earpads cover your ears and don’t allow them to ‘’breathe’’ so be prepared for some serious ear sweating. T3 headphones have reinforced joints between the earcups and the headband and they look more durable than on some other more expensive models but we are still skeptic. That’s probably the only bad thing regarding the construction quality. Skullcandy Crusher wireless headphones are not for everyone. They are designed for people who are really crazy about the bass and no one else. If you don’t like the bass that much, you won’t be impressed by these at all. If the bass is your only concern and you want your headphones to really make your head spinning, these are the right choice. Compared to other bass headphones, Skullcandy Crusher headphones have one of the best price/quality ratios (if by quality you mean bass quality or bass quantity and not overall sound quality). They really deliver extreme, mind-blowing bass at a reasonable price. If you can’t afford wireless option, there’s also the wired version. Skullcandy Crusher wired headphones were the predecessors of the wireless model we are reviewing. They deliver a similar listening experience and they are slightly cheaper. Besides the bass quality, Skullcandy Crusher headphones have many upsides – they look really nice, they look quite sturdy and durable, the control buttons are really beautiful simple, the headphones can be used as wired or wireless, and the battery life is excellent. When it comes to downsides, you should know that they are on a heavy side and they are not the most comfortable headphones out there. Clamping force is also really strong. There is that issue that’s common for most of the over-ear and on-ear headphones on the market – the hinges between the earcups and the headband are always the weakest link. Skullcandy Crusher headphones come in a nice, premium-looking box. Along with the headphones, you will get a detachable audio cable with in-line mic and remote, one AA battery for the built-in amplifier (goes into the earcup), one black pouch (it doesn’t offer much protection and you might want to buy some hard case), user manual, and 2-year warranty card. The headphones feature dual drivers – 2 full-range 40mm drivers and two additional subwoofers for improved bass response. There’s also the built-in amp powered by AA battery inside one earcup. Because of these additional pieces of equipment, they weigh 10.2 ounces which makes them one of the heaviest headphones on our list of 15 best bass headphones. The manufacturer doesn’t offer much info about technical specs but from what we experienced, you should not expect perfectly accurate reproduction across a wide range of frequencies. You will get a lot of bass and great loudness. 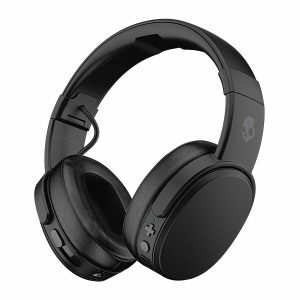 Skullcandy Crusher looks nice and elegant, especially the black model with a matte finish. They are a little bit on a large side and look bulkier than other headphones on the list (because of the dual drivers and built-in amp). The headphones seem well-built, nothing feels cheap or flimsy. There are a lot of metal parts and reinforcements and it looks quite durable and able to withstand heavy use. The only issue regarding durability are the hinges connecting the earcups to the headband and you can read about this issue in the next section. Comfort is not the best feature of these headphones. The ear cushions are made from synthetic leather, they are nice and soft, the headband is adjustable, and the headphones are foldable and don’t take much space. On the negative side, they are pretty heavy compared to other headphones on the list and they are very tight. Control buttons are nicely designed and easy to use. On the right side, you have the volume up and volume down buttons (large + and – buttons) that you can use to change tracks, too. Between + and – buttons, there’s the power/call/Siri/Google Assistant button. On the left earcup, you can find the bass slider, 3.5mm port, and micro USB charging port. When it comes to connectivity, you have two options – you can use them in Bluetooth and wired mode. Pairing is quite simple and it takes a few seconds, the headphones are in pairing mode the moment you turn them on. Bluetooth connection is quite stable and reliable and the range is almost 40ft under ideal conditions (around 15-20 with obstacles and walls). The battery is one of the best features of these headphones. The manufacturer claims that you will get up to 40 hours at high volumes which is true. You can get a lot more at 50% volume. When it comes to battery Skullcandy Crusher headphones are maybe the best on the market. There is also that fast charging feature – you can get up to 3 hours of playback after only 10 minutes of charging. You will need up to 3 hours to fully charge the battery. Regarding the sound quality, you should know that these don’t offer audiophile quality. They are not even close. The sound is not balanced and there is an incredible amount of bass even if you don’t set the slider all the way up. You won’t get this kind of experience with a regular pair of headphones no matter how you adjust the EQ. The bass is simply extreme. Bass is more boosted than on Sony’s XB950B1 or on V-MODA’s Crossfade M-100. On the negative side, vocals are kind of distant and hard to hear clearly at lower volumes. The mid-tones, in general, are muffled. Highs are pretty clean and crisp. Skullcandy Crusher headphones are an excellent choice if you are going to wear them while watching movies. The explosions really come to life with these. The headphones are great at isolating noise but they leak a lot of sound even at 50% volume. The mic is decent but not perfect. You will hear a small echo during the phone calls and it can be a little bit distracting. The person on the other end will understand every word and that’s the most important thing. These headphones are not for everyone. One reason is their weight and clamping force. They are not the most comfortable pair of headphones. In fact, they can be quite uncomfortable after only two hours of wearing. The second and more important reason is the sound. The bass is incredibly strong and heavy and it doesn’t get distorted even at high volumes. But the mids have to pay the price and a huge part of the midrange tones was sacrificed in order to achieve that kind of mind-blowing bass. If you like more balanced sound, these are definitely not for you. Fragile hinges between the earcups and the headband are the common issue for so many headphones on the market. And these are not an exception. Some customers complained about these hinges being too weak to withstand heavy use. We haven’t experienced any issues during our testing but some problems become obvious only after long-term use. Sennheiser HD 201 headphones are definitely the cheapest on the list. They are entry-level headphones made for studio use but they can be used for casual listening to music, too. Their bass response is slightly boosted but it’s not like with some previous bass headphones. There is no insane emphasis on bass. The mids and highs are just a little bit flat (probably because they were designed for studios) but they don’t get overpowered by the bass which is actually a good thing. You will get much nicer reproduction across the wide range of frequencies and nicer balance between lows, mids, and highs. If you are on a budget and you don’t mind the cable (which is really long), Sennheiser HD 201 might be the best possible choice. There are a lot of things we like about these headphones – they have that old-school Sennheiser design, they are very lightweight and comfortable, the sound quality they deliver is more than satisfying for the price, noise isolation is decent, and they don’t leak too much sound. Still, there are some downsides you have to be aware of – the cable on these headphones is not detachable and it’s extremely long, their build quality matches the price (so, it’s not impressive and there’s a lot of plastic parts), there is no in-line mic or any control buttons on the headphones or on the cable. Sennheiser HD 201 wired headphones come in a simple Sennheiser-branded box. There’s nothing premium or special about the package but the headphones are nicely packed and protected. Along with the headphones, you will get one ¼ inch gold-plated adapter, user manual, and 2-year warranty card. The cable is not detachable and it’s almost 10ft long which is probably too much for a regular user but they are designed for studio use and that’s why the cable is so long. Sennheiser HD 201 are over-ear headphones, they weigh only 165g (5.8 ounces), their frequency response spans from 21Hz to 18kHz, they have 24Ω impedance, sensitivity is rated at 108dB, and THD is less than 0.7%. HD 201 headphones look nice and elegant. Sennheiser decided to keep it simple and use that old-school design. They don’t look flashy or fashionable and they are definitely not made for sports. They are probably the best choice for listening to music at your home or in your office. That long cable can be really annoying during any activity. The construction quality is decent and matches the price. Everything is made from plastic but they still look durable. HD 201 headphones are very comfortable. They are very lightweight so you won’t even notice that you have them on your head. Both the earpads and headband are nicely padded but it would be even better if the padding was thicker. The headband is adjustable and the earcups can pivot. The only thing that could be considered an issue is the fact that they will cause some ear sweating but that’s the case with any pair of closed-back over-ear headphones. The headphones offer a decent amount of noise isolation. They are not noise canceling headphones but they manage to eliminate up to 30% of all the outside noise. They don’t leak too much sound but the person sitting next to you will hear your music if you crank the volume above 70%. The packaging doesn’t include any accessories. You will get only one ¼ inch adapter and that’s it. You won’t get a carrying pouch or hard case and you have to pay extra for it. The headphones are not foldable and not really portable. The cable is not detachable and it’s 10ft long which is too much. The cable is also really thin and it’s not tangle-free. There is no in-line mic and there are no control buttons of any kind. If you want to adjust the volume or control the playback, you have to use your phone or any other audio source connected to your headphones. ATH-M50x headphones are one of the highest-rated headphones on the market. They are more like entry-level audiophile headphones than bass headphones. They can still deliver nice, deep, and undistorted bass but also dynamic mids and clear highs. Besides the sound quality, the good things about M50x headphones are their portability, noise isolation, and the number of accessories you get. These headphones are not the most comfortable out there and they kind of look cheap but there were no many complaints regarding durability in the past. ATH M50-x come in a nice packaging. The package content and all the specs are listed on the back side of the box. 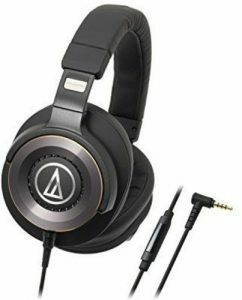 Along with ATH – M50x headphones, you will get 3 detachable cables (one 1.2-3m long coiled cable, one 3m long straight cable, and another 1.2m long straight cable) which is a huge plus for Audio Technica, one ¼ inch adapter, carrying pouch made from leatherette, user manual, and 2-year warranty card. ATH M50-x are over-ear headphones. They feature two 45mm neodymium drivers and weigh 10 ounces (they are pretty heavy). Frequency response spans from 15Hz to 28kHz, they have 38Ω impedance (you might need a headphone amp), and 99dB sensitivity. These headphones are not the best-looking pair of headphones on the market. They look kind of cheap, even like a toy. We can’t really say they are stylish, elegant, or anything like that. Audio Technica obviously paid more attention to the performance that to the design. Even though they are mostly made from plastic, there has been only a few complaints regarding the durability. We have tried to stretch them and put some pressure on the hinges connecting the earcups to the headband and they didn’t break. So, they are not that fragile. ATH M50x headphones are not the most comfortable headphones but they have an adjustable headband, earcups can swivel and pivot, and the headphones are foldable. The earpads and the headband have relatively thick layers of padding but some people find that amount of padding insufficient. Audio Technica included 3 audio cables in the package and the people from Audio Technica should be praised for that. All the cables are detachable and have the same twist and lock mechanism. Sound quality is the best thing about ATH M50-x. They don’t deliver an excessive amount of bass like many other headphones on the list. The sound they deliver is more balanced with tight and undistorted bass, dynamic mids, and crisp highs. If you are really crazy about the bass, you might not be happy with these headphones, but if you want nice but not overwhelming bass, ATH M50-x is one of the best options. The headphones do a nice job when it comes to noise isolation. They are not ANC headphones but they will isolate a decent amount of unwanted noise. They don’t leak too much sound but there is some leakage at high volumes. You can’t use just any detachable audio cable with these headphones. 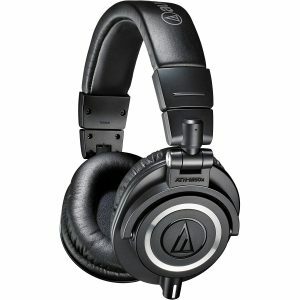 That twist and lock mechanism requires proprietary cable and you have to buy the cables from Audio-Technica. There are no in-line mic and volume/playback controls on the headphones or on the cables. If you want to adjust the volume, play/pause the song, or receive a call, you have to use your phone. The headphones have 38Ω impedance which is not too much but if you want to use them with your phone you should probably buy a headphone amp. They will work even without the amp but you will get much better results with it. The majority of complaints in the past were related to comfort issues. People complained about too strong clamping force and about the padding on the headband. To be honest, they aren’t the most comfortable but they don’t cause that much discomfort. Sennheiser Momentum 2.0 could easily be the most stylish pair of headphones on the market. These headphones really look and feel impressive. Everything about them is luxurious. There are a lot of things we like about these headphones – design and build quality, detachable cable with built-in mic and in-line controls, portability, and of course, the sound quality. Sennheiser Momentum headphones deliver balanced audio with impactful but not overwhelming bass, dynamic and detailed mids, and super clean highs. So, you get everything in one package. Still, there are two problems. The first one is the price. With that kind of premium look and performance comes the adequate price tag. These headphones are pretty expensive. The price varies and it can go up to $450. If you buy them for less than $300, you can consider yourself lucky. The second problem is the comfort. Sennheiser did everything to make them as comfortable as possible but some users complained about the padding on the headband. To be honest, the padding is not that thick but it’s not like you can’t wear them for 2 or 3 hours without taking them off. Cable can be a deal breaker for some people, so if you are a fan of wireless technology and you like the design and sound of Sennheiser 2.0, you should know that there is the wireless version that looks exactly the same. Sennheiser Momentum 2.0 come in a nice box that displays the headphones in the color of your choice. All the important features and technical specs are listed on the back side. Inside the box, there’s a luxurious hard carrying case with Sennheiser logo on it. Inside the case, you will find your headphones and one 3ft long detachable cable with in-line mic and 3-button phone controls. You will also get an additional carrying pouch, user manual, and 2-year warranty. Be aware that there are two different versions of Sennheiser Momentum 2.0 – one for Apple and the other for Android phones. The only actual difference between these two models is the cable but you still have to be careful when ordering the headphones. The frequency response spans from 16Hz to 22kHz, the impedance is 18Ω, sensitivity is 113dB, and THD is less than 0.5%. As we have said these headphones look but also feel expensive. They are made from high-quality materials and every single detail on them looks beautiful. The headphones are available in three colors – black, brown, and ivory (with brown headband). We are quite impressed by the build quality. The headband is made from real leather, just like the earpads, the hinges and some other parts are made from stainless steel. Only the earcups are made from plastic. We have no complaints regarding durability or design. Sennheiser made a beautiful and durable product, there’s no doubt about that. The comfort is not bad at all but some people complained about the headband padding and about the weight of these headphones. The paddings on the earpads are quite thick and very comfortable, the headband is adjustable, the earcups can rotate so you can adjust their position, too. The headphones are foldable and very much portable. Along with the headphones, you will get one detachable audio cable with a built-in mic and 3-button controls. The controls are simple and easy to use – the middle button is play/pause/call button, and you can use the other two buttons to adjust the volume or play the previous/next song. Sennheiser Momentum 2.0 headphones deliver excellent sound quality but they are not specially designed for bass heads. They offer much more balanced sound with deep and accurate bass, rich and detailed mids, and sparkling highs. They manage to create surprisingly wide soundstage considering the fact they are closed-back headphones. If you are crazy about bass, you won’t fall in love with these headphones but if you want a pair of headphones that sound good with any given music genre, these are one of the best choices. Sennheiser Momentum headphones isolate decent amount of outside noise but you can’t really compare them to some good ANC headphones. The built-in mic is pretty good. If you are in a quiet environment, there will be no echo or distortion of any kind. The person on the other end will hear you loud and clear. First of all, there’s the price. We are not saying they don’t look, feel, and perform great but you will have to pay a substantial amount of money if you want them. Some users complained about the uncomfortable headband that puts too much pressure on the head but we didn’t get that impression. Here’s another pair of Audio Technica headphones. They have that recognizable design like all the other Audio Technica headphones and they are, in a way, the upgraded version of M50-x. The bass is boosted just a little bit while the mids and highs remained intact. The way Audio Technica advertises ATH-WS1100iS might lead you to the conclusion that these offer much more bass than they really do. They mention huge 53mm drivers, venting ports for improved bass response but you won’t get mind-blowing bass. It all actually depends on what you expect – if you want crazy bass go somewhere else but if you want slightly boosted bass with clear and detailed mids and highs, ATH-WS1100iS headphones are a pretty good choice. These are often advertised as gaming headphones but they can also be used for music and movies. The headphones come in a nice-looking box with all the features and specs listed on the back. Along with the headphones, you’ll get one 1.2m long detachable cable with built-in mic and in-line controls (unlike M50-x, these headphones don’t feature twist and lock mechanism), carrying pouch, user manual, and 2-year warranty. The headphones feature really huge 53mm drivers and have really big earcups. They weigh 9.9 ounces, frequency response spans from 5Hz to 40kHz, sensitivity is rated at 100dB, and impedance is 38Ω (so, you should probably buy a headphone amp if you are going to use them with your phone). If you liked any of the models from M, Z, or X series, you will probably like these, too. They are slightly bigger than any model from M series. In terms of design, they don’t differ much from other Audio Technica headphones but you will notice those venting ports on both earcups and aluminum ring covering the front side of the earcup in order to prevent vibrations and improve the clarity of mid-range frequencies. There’re also those discrete golden details on the rims of both earcups. There is no difference when it comes to build quality either, Plastic is the most dominant material and there are a few metal parts. The headphones might look a little bit cheap but they are not cheap at all. They are actually well made and there haven’t been many complaints regarding the durability of these headphones. Even the hinges look firm and not flimsy at all. When it comes to comfort, these are not the best but they are not the worst either. They feature dual layer earpads. The earpads don’t look thick but rather deep. The headband is also well-padded. These headphones are foldable, the headband is adjustable, and the earcups can swivel and rotate. The only problem is the weight and the weird shape of the earpads. We’ve already said that they look rather deep, but not that thick. Your ear is supposed to fit into the ‘’cavity’’ and the driver is practically right next to your ear. Another thing we like is the detachable cable with the built-in mic and in-line controls. You don’t get that kind of cable with M50-x. The control buttons are pretty intuitive and simple to use. You can use them to play/pause/answer calls, adjust the volume or play the next/previous song. When it comes to sound quality, the emphasis is on the bass but it’s not really boosted that much. It just slightly deeper compared to ATH M50-x. Thanks to that new Extra Bass Venting System (bunch of small venting holes on the earcups) bass is slightly more impactful on these. The soundstage is not really wide and the mids get muffled from time to time. Vocals are not perfectly clear all the time. Highs are pretty clean and crisp. The headphones isolate (passively) a certain amount of outside noise but not as good as some other headphones in the same price range. The microphone is not perfect, you will hear a small echo during phone calls but it’s not alarming. After all, call answering is not the main purpose of these headphones. If you are crazy about the bass, you might want something wilder like Skullcandy Crusher which is even cheaper than ATH-WS1100iS. These do have slightly boosted bass but if you really want something with crazy bass, you should skip these. Considering the weight of the headphones and clamping force, a little bit more padding on the headband and on the earcups would make them much more comfortable. These headphones are different from other headphones on the list for many reasons. First of all, they have a neckband, not a headband. They are on-ear headphones, unlike all the previous over-ear models. Philips SHS5200/28 are much lighter and they are designed for an active lifestyle which means that you can wear them while running, working out, etc. They are nowhere near those previously reviewed headphones when it comes to bass quality or sound quality but if you want a nice pair of headphones with pretty good bass for your workouts and other activities that include a lot of movement, SHS5200/28 is the right thing. The only problem is the price. These headphones used to be much cheaper. You could find them for $20 or $30 max but, for some reason, the price went up to almost $70 and these headphones are not worth that kind of money. So, if you can find them for less than $30, you should definitely buy them but $70 is way too much for this kind of headphones and you can find many better choices at that price point. The headphones come in a cheap-looking transparent packaging. Inside the box, you will find your headphones with an undetachable 1.5m long braided cable with a gold-plated 3.5mm jack. There is also a user manual and a warranty card. These headphones are the lightest on the list – they weigh only 1.84 ounces. They feature two 30mm mylar dome drivers, the frequency response spans from 12Hz to 24kHz, impedance is 24Ω, and sensitivity is 106dB. These headphones are designed for active people and sportsmen and they obviously look sporty. The reflective neckband goes behind your head, the ear hooks are supposed to go over your ear and the cushions are resting on your ears. That way, you can move your head as much as you want and the headphones won’t fall. We are not really impressed by the build quality. They are mostly made from plastic and the neckband is covered with a thin layer of rubber. The cushions are made of some sponge-like material. The headphones are very comfortable thanks to their weight. You won’t even notice they are on your head. The earcups don’t put too much pressure on your ears but the ear hooks can hurt the top of your ears if you move too much. They need to be softer and that’s the only problem regarding comfort. As we’ve said, these can’t compete with previously reviewed models since it’s a completely different type of headphones. They are not as loud and don’t offer perfect sound quality, but they do offer pretty aggressive bass for their size and price (if the price is $30). They don’t isolate outside noise very well but considering the fact that they are made for active lifestyle and sports, you should probably stay aware of your surroundings. They also leak a certain amount of sound at high volumes but it’s not alarming. Current price on Amazon is way too high considering their build quality and performance. If the price stays this high, just avoid them – they are not worth $70. If you get a discount or find them for less than $30, you should definitely buy them. The headphones don’t have a built-in mic or in-line controls so you have to use your phone if you want to change the song or adjust the volume. Pioneer Pro DJ HDJ-1500 are specially designed DJ headphones. They are not entry level headphones like HDJ-500 and they are also not a flagship premium model like HDJ-2000. They are something in between just like HDJ-1000. They can be used for regular music listening if you are into bass and you probably are since you are reading this. They offer pretty solid and punchy bass, maybe even a little bit overwhelming. Besides the bass, we love that recognizable Pioneer HDJ-series design and the fact that HDJ-1500 can isolate a lot of outside noise. 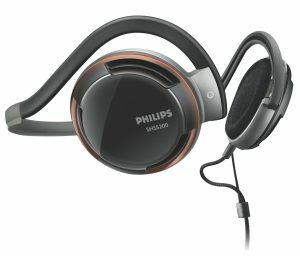 The headphones feature detachable (replaceable) audio cable, they can be folded, and the earcups can swivel and rotate. HDJ-1000 are not the most comfortable on the market but you can wear them for about two hours until the pressure on your head becomes too strong. We are not impressed by the fact they are mostly made from plastic but what can you do. Most of the headphones today are made of plastic, even some really expensive models (like Beats and Bose) so it’s not such a huge deal breaker. Just like all the other plastic headphones, joints between the earcups and the headband are the most fragile part and you should handle them with care. The other thing we don’t like is the amount of padding on the headband. There’s only a thin layer of padding on the top and nothing else. They will become quite uncomfortable after a few hours of use. Inside a nice box with Pioneer logo on it, you will find your headphones, one detachable 1.2m coiled cable with twist and lock mechanism (3.5mm gold-plated jack on one side, 2.5mm jack on the other side), one ¼ inch adapter, black carrying pouch, user manual, and 1-year warranty card. These are closed-back headphones with 50mm dome drivers. You would assume they are over-ear headphones but the earpads are quite large and the headphones are actually on-ear. You can easily change the ear cushions and insert some thicker but narrower cushions and make them over-ear headphones. The headphones weigh 285g (10 ounces), their frequency response spans from 5Hz to 30kHz (they can go really low), the sensitivity is 108db (quite loud), and the impedance is 32Ω (you don’t have to buy an amplifier, they will work just fine with your phone). 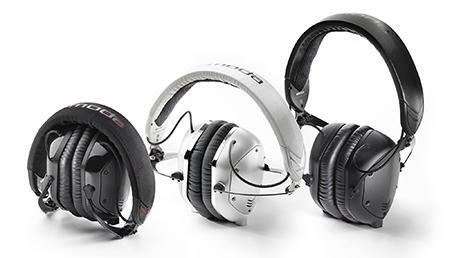 HDJ-1500 feature recognizable Pioneer design like all the other DJ headphones from the HDJ series. They look stylish and they are quite large. The available colors are black, gold, silver, and blue. As you already know, they are mostly made of plastic. There are some parts made from lightweight magnesium alloy but all the important parts are plastic. Still, they look well-built and there have been no complaints regarding durability in the past. Even the hinges proved to be more durable than on some other headphones. HDJ-1500 have an adjustable headband, the earcups can swivel and rotate. The headphones are also foldable. The earpads have thick layers of padding made from memory foam. Those ear cushions are quite large and the hole in them is really small so if you have an average ear size, the headphones are going to rest on your ears. The padding on the headband is also made from memory foam but it covers only a small part on top of the inner side of the headband. Because of such a small padding and because of their weight, they will become uncomfortable after some time. The clamping force is not too strong but after 2 hours or so, your ears will inevitably become hot and sweaty. The headphones are bass-oriented but the bass is not overwhelming. Certain bass frequencies are boosted so you can match the beat if you are a DJ. The clarity of mids and highs is not perfect but they are quite articulate most of the time. When some bass-heavy song is playing, the bass will overpower some midrange frequencies but other than that, the sound quality is more than satisfying and if you are a bass head, you will be happy with this kind of sound. HDJ-1500 seal the space around your ear nicely even though they go on your discrimination and not over your ear and they manage to attenuate a great amount of outside noise. The amount of padding on the headband is not sufficient. It would be nice to see an upgraded version with better headband padding. Joints connecting the earcup and the headband are made from plastic and they are usually the weakest parts on this type of headphones. Since HDJ-1500 headphones are made for DJs, they don’t have control buttons or built-in mic. Their main and only purpose is listening to music. Most of the headphones on our list of 15 best bass headphones and on the market are actually made from plastic but these are completely different. The previous Sennheiser headphones on the list (Sennheiser Momentum 2.0) were premium headphones, but these are even more premium, especially when it comes to build quality. Sennheiser Momentum 2.0 headphones are maybe more attractive but these are more rugged and one of the most durable on the market. The design is really nice, the controls are simple, they feature rotary variable bass knob, and the sound they deliver is really great. We are sure that you will love it if you are a bass enthusiast. They don’t have wild bass like Skullcandy Crusher headphones but the bass is very present. Despite all the positive things we didn’t like the cable which is not detachable and it’s kind of thin. The weight is also problematic. 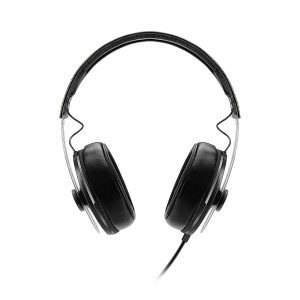 These are the heaviest headphones on the list (14 ounces) and they will cause fatigue and pain in your head and neck after 2 hours of use (or even less). These headphones don’t deliver neutral (accurate) sound. The sound is definitely bass-oriented and the mid-range frequencies will sound muddy from time to time, especially when some bass-heavy song is playing. These headphones are not an audiophile material but they are a great choice if you are a bass head. Sennheiser HD 630VB headphones come in a premium box. Inside the box, you will find a really nice hard carrying case. The headphones are inside the case. HD 630VB feature 1.2m long cable with 3.5mm gold-plated jack. The cable is not detachable. You will also get one 6.3mm adapter, user manual, and 2-year warranty. As you already know, the headphones weigh 400g (14 ounces). The frequency response spans from 10Hz to 42kHz, the impedance is 23Ω (which means that you don’t need a headphone amp to power them but they actually sound much better with an amp), the sensitivity is 114dB (they are quite loud), and THD is less than 0.08% (really small amount of distortion). Along with Sennheiser Momentum (which are definitely the best-looking pair of headphones on the list) and V-MODA Crossfade M-100 (close second or maybe even third place), Sennheiser HD 630VB are one of the three most beautiful pairs of headphones on this list (maybe even on the market). They look and feel premium and there is absolutely no doubt about that. Build quality is fantastic. There’s a lot of aluminum components – ear cups, hinges, sliders, headband. All in all, these are the sturdiest headphones on the list. The Sennheiser did everything to make them as rugged as possible. Comfort is not the best feature of these headphones. The earpads are beautiful, they are well padded and fit really nice around ears. We can’t say the same about the headband. There is a layer of padding but it’s not as thick as the padding on the earpads. The weight will also be an issue for some people but with that kind of rugged construction comes some extra weight. They can be really fatiguing because of the weight. The headband is adjustable, the earcups can swivel and rotate, and the headphones are foldable. The controls are located on the left earcup. You have three buttons – the one in the middle is used to play/pause songs and answer/end calls, and the other two are volume buttons. And then, there is that bass wheel around the earcup that you can use to adjust the bass. The headphones feature the built-in microphone. The sound is definitely colored. It’s not perfectly balanced and the emphasis is on the bass. As we have already said, these are not made for audiophiles and they are not the best choice for studio work. Rotary bass wheel control allows you to adjust the bass to your preferences (+/- 5dB). The bass is pretty tight and strong even when this feature is turned off. Bringing more bass can be good for some genres and some songs but not always. Too much bass will muffle some mid-tones and vocals. The noise isolation is really good. These are not noise canceling headphones but they isolate great amount of outside noise. They also leak a certain amount of sound even at medium volume. The cable is not detachable and it’s kind of thin. It doesn’t look as sturdy and durable as the headphones, which is really bad. If the cable breaks or if you experience some other cable-related issue, you can’t replace the cable on your own. 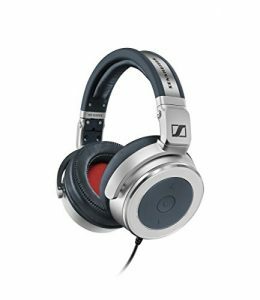 You will have to go to some authorized Sennheiser repair service or send the headphones to Sennheiser Repair Centre. The weight will cause some discomfort after only two hours of use. They made the headphones rugged and durable but they had to add some extra weight to them. These headphones are not for everyone. Because of the strong bass, the mids lack depth. The vocals lack body and sound muffled if the bass is set to maximum. The headphones have 23Ω impedance which means they can be driven by your phone but they actually sound much better and louder when connected to a headphone amp. The next pair of bass headphones on our list of 15 best bass headphones come from Germany. 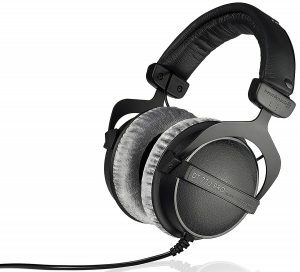 Beyerdynamic is a well-known name among professionals and we are presenting to you their DT 770 PRO studio headphones. We have decided to go with 32Ω version but there are also 80Ω and 250Ω models. The reason why we picked this one is the fact that you don’t need an amp to drive them. You will definitely need an amp for the 80Ω model and you will need some really good equipment to get the most out of that 250Ω version. So, if you want a nice pair of headphones that can work with your phone, the 32Ω model is the best choice. These headphones are advertised as very accurate and detailed but, in our opinion, they actually deliver powerful and solid bass and clean highs, while some mid-range frequencies are actually recessed. The bass is not overwhelming, it’s just slightly boosted and the sub-bass frequencies sound awesome. Besides the sound, we loved the design, build quality, and comfort they offer. We didn’t like the cable which is too long and undetachable and we also didn’t like the fact that there are no remote controls on the cable or on the earcups. The headphones come in a really nice white box with all the features and specs listed on it. 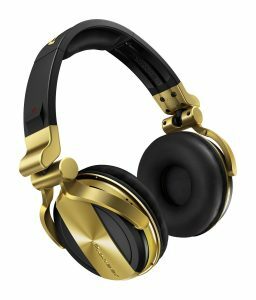 The headphones feature 1.6m long undetachable cable with a 3.5mm gold-plated jack. Along with the headphones, you will get one ¼ inch adapter, black carrying pouch, user manual, and 2-year limited warranty. DT 770 PRO headphones feature large 45mm drivers. They are closed-back over-ear headphones. Their frequency response spans from 5Hz to 35kHz, sensitivity is 96dB (they are not really loud like some other headphones on the list), THD is less than 0.2%, and the impedance of this specific model is 32Ω (but, as you know, there are also 80Ω, and 250Ω models). The headphones weigh 270g (9.5 ounces). The headphones are aesthetically pleasing. They have a nice black finish (or gray finish, depending on the version) and gray earpads. All in all, they look really nice and elegant. Build quality is more than satisfying. The whole frame is made from metal (hinges, headband) and the earcups are made from hard plastic. They don’t feel cheap and look like they can withstand heavy use. Comfort is one of the best features of DT 770 PRO. The earpads are made from velour and they are super-soft. There’s also a thick layer of padding all across the headband. Both the earpads and the headband padding are replaceable which is a great thing. You can also put pleather earpads instead of velour if you want better isolation and tighter bass. The headband is adjustable and the earcups can swivel (but they can’t rotate). The headphones are not foldable and they are kind of large so not really portable. The cable is a bit too long so we don’t recommend using them outdoors but they are great for listening to music at your home or in your office. Some people complained about the earpads making their ears hot and sweaty but that’s more of a personal thing related to your body temperature. Of all the headphones on our list, these are probably the most comfortable. Sound quality is pretty good but not excellent. These are not exactly an audiophile material. The bass is pleasingly powerful and slightly boosted but not overwhelming. Still, it’s very much noticeable. The same goes for treble. The soundstage is surprisingly good considering the fact that these are closed-back headphones. Some mid-range frequencies are recessed, especially the voices and they tend to sound muffled at high volumes and when there’s a lot of bass. Noise isolation is not the best. It’s not like they don’t isolate any noise but we’ve expected more. The headphones also leak a substantial amount of sound at high volumes. There are no control buttons on the earcups or on the cable and that could be a drawback for some people. The cable is too long and it’s not detachable so if anything happens, you can’t replace the cable on your own. The headphones are also not foldable. Bluedio U Plus UFO headphones are wireless over-ear headphones with a boosted bass response. Bluedio managed to put 6 drivers inside each earcup and tune them to produce an incredible amount of bass. Unfortunately, the mids and highs had to suffer a lot because of the bass but if you are really crazy about the bass, you might like this kind of audio signature. From the audiophile point of view, this kind of sound is absolutely unacceptable. The things we like about these headphones are design, build quality and ruggedness, Bluetooth connectivity, and battery. The sound is probably too ‘’bassy’’ for most people but if you are a bass head, you will appreciate it. On the negative side, these headphones are quite bulky and heavy, they are not very comfortable, they don’t support aptX Bluetooth profile or NFC pairing, and their price doesn’t really match the performance. They cost almost $200 and that’s too much in our opinion. Yes, they do look beautiful, they are made of premium materials, the battery is great but the sound quality is not impressive. So, if you don’t love the bass that much or if you want to hear clearly the rest of the audio spectrum as well, look elsewhere. Bluedio UFO Plus headphones come in a premium packaging. The presentation is really nice and it looks impressive. Along with the headphones, you will get hard travel case with a metal carabiner, USB to micro USB charging cable, one detachable coiled audio cable, 6.3mm adapter, user manual, and 18-month warranty card. These are over-ear headphones. The earcups are huge because there are 6 drivers in each earcup (3 for treble and 3 for bass and mids). This kind of driver arrangement is patented by Bluedio and it’s called PPS12. It’s supposed to deliver more spacious sound. The frequency response spans from 10Hz-22KHz, the impedance is rated at 32Ω (the headphones can be driven by your phone and you don’t need to buy a headphone amp), sensitivity is 112dB (they can be pretty loud), THD is less than 0.1%. Along with Sennheiser HD 630VB, Bluedio UFO Plus headphones are the heaviest on the list. They weigh 397g (14 ounces). Bluedio U Plus UFO headphones are more elegant than some older models made by Bluedio but they are also quite larger and heavier. In our opinion, these are not among the most beautiful headphones on the list but they are still visually appealing. Build quality is excellent. They are mostly made of hard but lightweight aluminum alloy (headband, hinges, headband extender) and the earcups are made of hard plastic. All in all, they are very rugged and they look and feel very durable. When it comes to comfort, there are some good things and some bad things. The good things first – the earcups can rotate backward, the headband is adjustable, and the headphones are foldable which improves portability but they are still bulky (even when they are folded). The paddings on the earcups and on the headband are very thick but the weight is a problem. They are pretty heavy and the weight will cause fatigue after an hour or two of use. The headphones are not suitable for sports because they are unstable. Control buttons look very nice. All the controls, as well as the micro USB charging port, are on the right earcup. The controls are simple and intuitive. The button in the center of the earcup is a multifunction button (play/pause/call), and you have two volume buttons and two track-skipping buttons. You can also use track skipping buttons to activate or deactivate the 3D sound feature (which is actually a bass boost feature). You just have to press and hold the next track button to activate 3D sound or press and hold the previous track button to deactivate 3D sound. 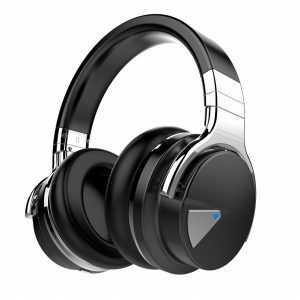 Bluedio U Plus UFO headphones feature Bluetooth 4.1. The headphones are in pairing mode the moment you turn them on. The connection is quite stable. We haven’t experienced any issues regarding the connection. The range is 25ft which is pretty good. The battery is one of the best features of these headphones. You will get up to 25 hours of playback time per one charge (at moderate volume). Recharge takes almost 3.5 hours. If you run out of battery you can always use that audio cable that comes with the headphones and connect it to either earcup (there are 3.5mm ports on both earcups). These headphones, as you already know, deliver an incredible amount of bass even when that 3D sound feature is not active. The bass is maybe too emphasized and it overpowers other frequencies. It even becomes boomy at high volumes. The mid-range frequencies are recessed and sound muffled (especially the voices). High-mid frequencies are there and they sound clear. This kind of sound is not for everyone. These headphones are designed for serious bass heads. Even though these are not ANC headphones, we have expected a little bit better noise isolation. Bluedio U Plus UFO headphones don’t isolate low-frequency noise at all. The headphones are better at isolating high frequencies but overall noise isolation is not impressive. They also leak a certain amount of sound at high volumes but it’s not alarming. The microphone is not useless but it’s not the best. Your voice will sound distant on the other end but it will be audible. If you are in some noisy environment, the situation will be much worse – the microphone doesn’t handle outside noise well. The headphones don’t feature NFC pairing which is surprising considering the price. They also don’t support aptX Bluetooth profile and they are not a good choice for watching movies. Bluedio U Plus UFO headphones are not very comfortable because of their weight and because of the clamping force. This was our selection of 15 best bass headphones. We have tried to make an in-depth analysis and list all the upsides and downsides. Hopefully, you have found something interesting that meets your requirements. Before we say goodbye, let’s just make a short summary and list all the thing you should consider before buying a pair of bass headphones. You won’t notice much difference on the outside but there are some things that could indicate that some headphones are meant for bass-heavy music like venting ports and bass boost knobs and buttons. If the headphones have those buttons and ports, they are definitely designed for bass-heavy music but that still doesn’t mean they are good at reproducing low-end frequencies. The real difference is on the inside. Yes, it’s all about the drivers and chips. First of all, there is the size of the drivers. As they say, you need big drivers if you want big sound. Bass tones are low-frequency tones and as you may know, wave frequency and wavelength are inversely proportional (the lower the frequency of the sound wave, the greater the length). For long sound waves, you need big drivers and big cups. As the technology advances, the manufacturers manage to make smaller and smaller drivers and they can be pretty good even when it comes to bass reproduction but don’t be fooled, they will never be as good as the big drivers, at least when it comes to bass. So, if you want stronger punch and mind-blowing bass, on-ear and over-ear headphones are a much better choice than in-ear headphones. Still, they have some downsides, too. These headphones tend to be bulkier and heavier and they are not as portable as small in-ear headphones (earbuds). So, it all comes down to your needs – if you need something portable for your workouts, earbuds (or maybe some foldable on-ear headphones are a much better choice), but if you need really great bass, there’s no better choice than good old over-ear headphones. Second of all, the material the drivers are made from matters a lot. Don’t buy headphones with paper drivers. Many cheap models use those. You need some flexible but strong material that’s able to withstand a lot of movement. The number of drivers can be important, too. Some manufacturers use multiple drivers in order to cover all the frequencies and achieve good reproduction across the audio spectrum but that doesn’t mean they all do a great job. Sometimes, one large driver is better than 3 small ones. The size and shape of cups and type of earpads are also important. A small change of earcup shape can make a big difference in terms of sound signature. By changing the shape of the cups, manufacturers can get more aggressive and punchier sound signature. The same drivers in some other enclosure will have a flatter and more accurate frequency response. Also, the enclosures (cups) with venting holes are a better choice for bass heads. Changing the earpads can make a significant difference – velour earpads are much more comfortable but they also color the sound in a way that’s not good if you are a bass head. In general, you will get a better bass response with pleather earpads. In the end, there’s that bass boost button or knob on some headphones. The manufacturers try to indulge their customers and, as a result, you have a bunch of headphones with the bass boost feature. The manufacturers actually install a software (like an equalizer) and use it to put an emphasis on a certain set of frequencies (low-end frequencies). That way, they boost the bass a little bit. But they can also boost it too much and make it distorted and very unpleasant. So, the existence of the bass boost feature is not a guarantee that you will get much better bass. The best thing you can do is to test the headphones at moderate to high volumes with bass boost on and hear if there’s too much distortion. If you can’t test them, the next best option is to read our reviews and find the pair that’s best for you. The list of things you should consider when buying bass headphones is quite large but we will try to make it simple and list only the most important ones. Limiting your budget can be a really difficult task especially if you are into audio equipment or electronics in general. New and upgraded pieces of equipment are being produced every day but you can’t have it all. It’s important to set your limits. Our advice is to spend at least $50. That should be your lower limit. There are a bunch of affordable headphones out there and you can find a pair for less than $20 but if you want good performance and nice punchy bass, great durability, and a decent amount of comfort, anything under $50 is not a good choice. The upper limit is your choice. The price can go up to $1000 or even higher. When it comes to the type of headphones, our favorite are over-ear headphones and that’s not a secret. But you will have to make your own choice. When choosing between these three types of headphones, you will have to consider your needs and make some compromises. You have to decide what are the most important characteristics – you can’t get a great amount of comfort, great portability, and great sound quality in one pair of headphones. In-ear headphones are super-portable and they are a great choice if you are going to use them on the go. On the other side, they don’t really offer a satisfying amount of comfort since they go in your ear. They also don’t deliver a great bass response. Don’t get this wrong – some earbuds have incredible bass but if you compare a pair of earbuds and a pair of over-ear headphones and if they are priced the same, those over-ear headphones will win in 9 out of 10 cases. On-ear headphones are not as portable as earbuds, but they are still not the worst choice if you need to transport them, especially if they are foldable. They offer much more comfort than in-ear headphones but it all depends on the clamping force – if it’s too strong, your ears will get tired and sweaty in two hours. On-ear headphones have bigger drivers and deliver better and deeper bass than earbuds but they are not as good as over-ear headphones when it comes to bass response. Over-ear headphones can be really comfortable but they will make your ears sweaty, especially if they are closed-back headphones. Open-back headphones allow air to go through the headphones and prevent sweaty ears so if you want the greatest amount of comfort, open-back over-ear headphones are maybe the best choice. Still, there’s the size and weight issue. Over-ear headphones are larger and heavier than other types and that could be a problem for some people. Over-ear headphones are the least portable type of headphones (even if they are foldable) and they are the worst choice if you need something for your workouts or something that you can use on the go. On the other hand, they offer the greatest sound quality and the best bass reproduction (when compared to on-ear or in-ear headphones within the same price range). There’s also an important difference in sound signature between open-black and closed-back headphones. Open-back headphones deliver much cleaner, more natural and more balanced sound with flatter frequency response and wider soundstage. Closed-back headphones deliver stronger, more aggressive bass and usually don’t have a flat frequency response. The emphasis is often on the bass. Wireless headphones have become extremely popular over the last decade. They offer great freedom and cable-free environment but they are still not as good wired headphones. If your main concern is sound quality, then you should buy wired headphones but if you don’t care about few imperfections and the amount of detail in your music, Bluetooth headphones might be the best choice and we have included a few Bluetooth models on our list of 15 best bass headphones. If you want wireless headphones, you should also pay attention to the Bluetooth version. Newer versions enable faster data transfer and less compression which results in better sound quality. They also have lower power consumption. In short, newer Bluetooth versions are definitely better. Also, you should pay attention to the battery – if it can’t last for at least 8-10 hours, it’s not good enough. 8 hours or more is what you should be looking for. In order to get high-quality sound without distortion, you should be looking for high-quality materials. Drivers made of paper are not a good choice. Flexible but durable materials are a much better option. Dedicated drivers for bass, mid-range, and treble (multiple drivers) can make a difference but only if they are made of quality materials and if they are tuned nicely. Since we are talking about bass headphones, bass quality, as well as overall sound quality, are the most important things. You don’t want mind-blowing bass at any cost. Other frequencies are equally important. Having great bass response with too harsh or absolutely lifeless treble is pointless. What you need is a pair of headphones with nicely balanced sound, dynamic mids, sparkling highs, and slightly boosted bass frequencies (probably just the sub-bass or mid-bass frequencies). When it comes to bass boost, you should know that too much bass really exists. If a certain set of frequencies is overemphasized, it will overpower other frequencies and you won’t be happy with that kind of sound. Too much bass can also cause really noticeable distortion and ruin your listening experience. You should also know that the shape and size of the earcups (enclosures) can change the sound signature. The exact same type of driver combined with the same electronic parts won’t sound the same in two different enclosures. The type of earpads also plays a role and changes the sound. Velour earpads make the sound warmer while pleather earpads make it more ‘’bassy’’. Noise isolating (or noise canceling) can really improve your listening experience. It doesn’t have a direct influence on sound quality but it can make your sound cleaner and remove all the unwanted noise. If you want a pair of ANC headphones you should be prepared to pay a lot for some quality noise canceling. The cheaper models can make some annoying buzzing sound and can also make your music really quiet. So, if you don’t want to pay $250 or more, you should probably buy a pair of over-ear headphones with nice passive noise isolation. Technical specs can be so confusing but, to be honest, many of those numbers don’t mean a thing if you don’t like the sound. The best thing you can do is to put the headphones on your ears, test them, and find out whether you like them or not. If you don’t have the opportunity to test the headphones on your own and you are trying to understand the specs and compare different headphones, here are some explanations. Frequency response describes the range of frequencies that a pair of headphones can reproduce. This info doesn’t tell you much if it’s not paired with frequency response curve. The manufacturers love to brag about frequency response – for example, they can say that their headphones can play any sound from 10Hz to 40kHz but since you can’t really hear anything above 20kHz it might seem pointless. Still, if the range is wider, you will get just a little bit more detail and your listening experience will be better. Anyway, if the headphones can reproduce sounds below 30Hz and above 18kHz, you should take them into consideration. Frequency response curve tells you much more about headphone performance than frequency response. You just have to know how to read it. The manufacturers are trying to achieve so-called flat frequency response (equally good reproduction of all the frequencies). That’s the audiophiles’ holy grail. Since you are looking for bass headphones, this curve should have a small bump somewhere in the bass region (meaning that some bass frequencies are emphasized). You should be careful about this one, especially if you are going to use the headphones with your phone. The impedance tells you how hard it is to drive the headphones (or how much power you actually need). The headphones with greater impedance are harder to drive and they won’t be as loud as some low-impedance headphones when you connect them to your phone. If you want to use the headphones with your phone, you should be looking for 32Ω impedance or lower. Your phone can probably drive some 50Ω or even 100Ω headphones but they will be really quiet and you will notice a huge difference if you attach a headphone amp to your phone or if you connect the headphones to your PC or some more powerful audio source. Headphones with an impedance greater than 100Ω can’t be used with your phone unless you buy some headphone amp. High-impedance headphones handle electric signals better than low-impedance headphones and produce more accurate sound, so if you want a high-quality sound, you should go for high-impedance headphones but you should know that you are going to need an amp. If you don’t want to worry about one additional piece of equipment, go for 32Ω impedance or lower. Sensitivity is closely related to impedance and it actually tells you how loud a pair of headphones can be. The problem with sensitivity is that not all the manufacturers use the same measurement method. So, you can’t really compare headphones made by different manufacturers (at least, you can’t do that accurately). Generally speaking, it’s good if the sensitivity is greater than 90dB but if you want a pair of high-end headphones it should be greater than 100dB. THD stands for True Harmonic Distortion and you should be looking for the lowest possible percentage (less than 0.1% would be great). This rating tells how much the sound transforms from the moment it enters the headphones to the moment it comes out. Different manufacturers can measure THD at different frequencies and volumes (they choose the point where the distortion is the lowest), so it’s really hard to compare them but you will be just fine if this number is lower than 0.1%. This is the end of our article on 15 best bass headphones. We have tried to be as informative as possible but if you still have any doubts or questions feel free to comment or ask for advice. PrevAre Volume-Limiting Headphones Safe for Your Child? 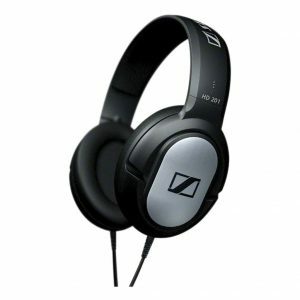 I have a pair of Sennheiser HD 201 headphone, it nice sound but it’s not a perfect. Very cheap, good sound, really comfortable and looking good, the volume output is very good for this headphones and I think that HD 201 is better than my old Sony CD 999. Very bad bass. This headphone is not to loud so if you want something louder don’t buy this model. Thanks for sharing your impressions. Sennheiser HD201 are definitely not the bassiest headphones on the list and they don’t have a huge bass boost, but we don’t think the bass is really that bad (considering the price). We are on the same page when it comes to loudness.